India 4 January 2017: If you’ve dreamed of studying Down Under and exploring the outback of Australia, you’re not alone. Australia is the third most popular study-abroad destination behind the United States and United Kingdom — and for good reason. Australia isn’t just kangaroos, koalas and beautiful scenery. Australia is also known for its vibrant cities like Sydney, Melbourne, Perth and Brisbane, along with its outstanding university system. Educational institutions in Australia offer a wide variety of courses and degrees with affordable tuition. Not to mention, Australia is at the forefront of technology and scientific research. That’s why, in 2015 over 600,000 students chose Australia as their study destination, a 9.8 percent increase on 2014 and comparable to the average annual growth rate of 6.1 percent per year over the past 10 years. Australia continues to be a top destination for Indian students with 72,504 enrolling in 2015. Those students accounted for 11.2 percent of all international students in Australia, behind only China, and up 15.6 percent since last year. If you’re looking to study in Australia, you’ll need to prove your English-language skills for a student visa. Lucky for you, the TOEFL test is accepted by every single university in Australia. That means that no matter which university you apply to, your TOEFL score will be recognized. The TOEFL test is an English-language assessment that measures your ability to use and understand English as it is read, written, heard and spoken in the university classroom. So your future professors will trust that when you attend class, you’ll be an active participant. 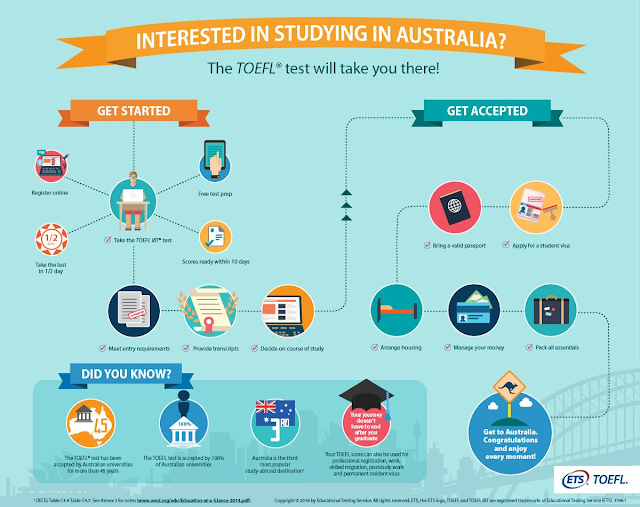 If you’re looking to admire the Sydney Opera House or explore the Great Barrier Reef, the TOEFL test can take you anywhere in Australia. Even more good news: Once you don your cap and gown and receive your diploma, you can apply to stay in Australia. TOEFL scores are now used for Australia’s post-study, business, skilled migration, work and holiday visas. This means you can focus on preparing for one test throughout your entire journey. For more information about the TOEFL test and how scores can be used, visit the TOEFL website.